A number of factors contributed to a late start on this project - the election situation which delayed the tender signing and the unprecedented fire situation tying up equipment To make matters more complicated we have had an early start ( 3 weeks) to winter like weather. 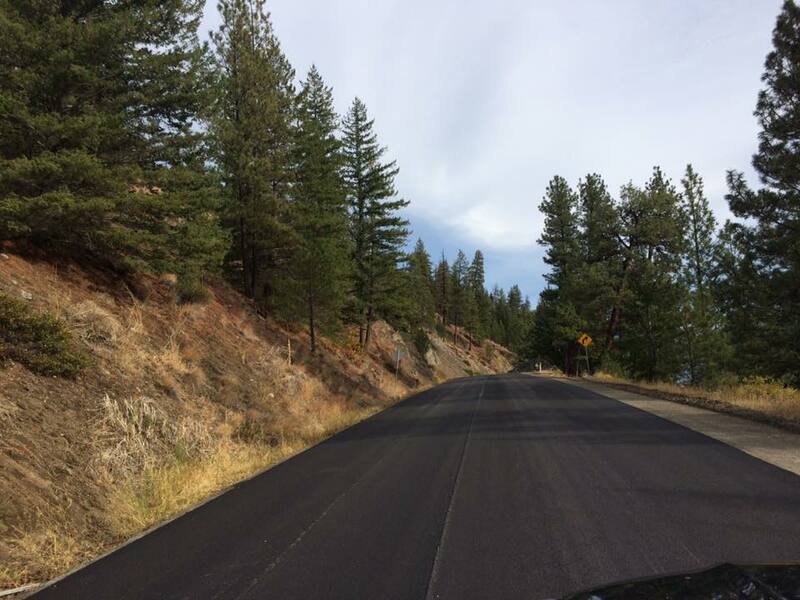 I spoke to MOTI officials today as a result of a variety of concerns on the paving so far. The first layer is a level course layer and that is followed by a top lift layer. The contractor is currently working hard to complete the 25 km section at our end - both layers and finishing touches and replacement of barriers etc - before winter hits. If they do not succeed, they will need to basically put barriers back and come back in spring. The 12 or so kms on the other side of Terzaghi Dam on Rd. 40 is next. Same story as our end...if they have to take the winter break they will, but they will be back in the Spring. The school parking lot is still on the list and will be paved out of the project funding - thank you MOTI! The Ministry has a quality assurance program where they take cores of the new paving and they analyze - contractor can receive penalties or bonuses based on what that analysis shows. Lets just hope they do a good job. The No Firearms Discharge Bylaw encompasses areas around Tyaughton Lake, Gun Creek Rd., Gun Lake, Gold Bridge and Bralorne. The link to the bylaw is below and scroll to the end to see the maps. 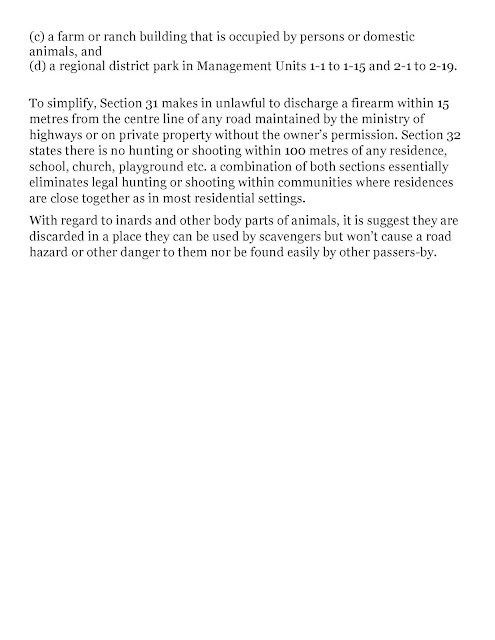 We have had some challenges siting the No Firearms Discharge signs in the Tyaughton Lake and Gun Creek Rd. corridors due to vandalism of other signs (cut off and removed) as well as MOTI rules around where these signs can go. This has required other security steps be taken so as you as the taxpayer don't have to pay exorbitant amounts to replace signs which are stolen. We are working on it though, it will get done eventually. If a party is hunting legally within the boundaries of the No Firearms Discharge bylaw maps they are permitted to do so. 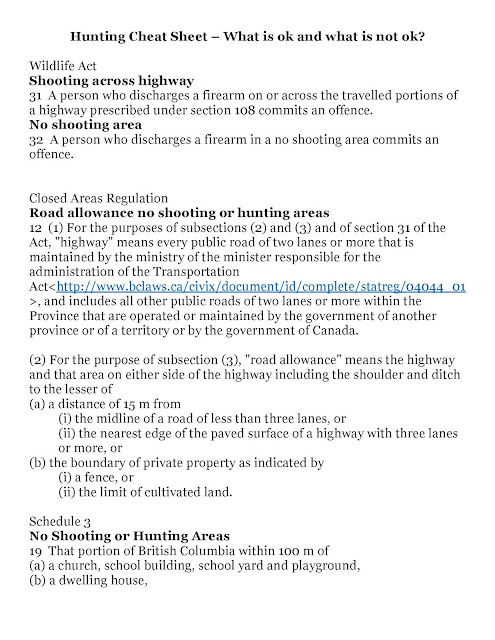 The trick is to understand what "hunting legally" means, this cheat sheet is based on Provincial legislation and regulations and I ran this by the Conservation Officer for our area for accuracy. And of course, you can report to both. The trick is getting accurate and identifying information to report - smartphone cameras and so on are great tools in this regard. As a result of several search and rescue type situations that demonstrated a lack of coordination and a lack of local knowledge I drew the first responders and our emergency management department together informally to brainstorm a list of actions that would improve the situation. A number of very good ideas emerged. Ryan Wainwright, the SLRD Emergency Program Manager sought and has been granted permission to use an EMBC PEP-COORD channel. Darren Oike from the District of Lillooet coordinated with all first responder groups serving the BRV and Lillooet area around implementation – turns out District of Lillooet had been working on the same thing. It has now been used successfully on a number of occasions. 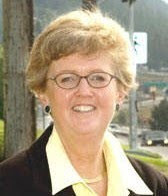 EMBC has a protocol in place for use of their channel so it wasn’t necessary to develop one. The SLRD Emergency Program Manager, Ryan Wainwright will be discussing use of the channel with Seton Fire Department and Gun Lake Fire Protection Society in the next short while. This is a step in the right direction although a number of the other ideas brought up will also need to be actioned to make SAR’s and other types of rescues more effective in our area. As I sit here it is October 18 and it is just snowing like crazy! So much for fall, maybe it will come back. Below are a few Gun Lake Items for your attention. 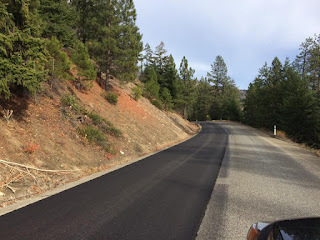 This application is to create a public road on a landlocked piece of property. Please let me know if you have any questions or comments and I'll try to get them answered. Douglas Fir Bark Beetle (DFB). I encourage you to look at the map titled DFB_haz_Gun at the link as an example. 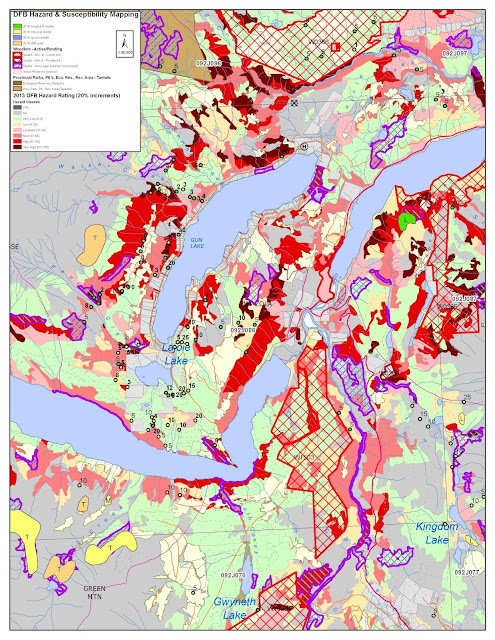 This maps shows the susceptibility - the greater the redder. Then you will see green dots with numbers beside them, those show current attacks. If the green dots are near or in a red/deep red area you can be assured the tree kill will be very efficient in these areas. If those dots show your property you need to do something to stop the spread of Douglas Fir Bark Beetle. There is an excellent pheromone treatment which some of us have been using that has proven effective if you get them out at the right time. Last year we ordered 1132 packets. Depending on the 2017 results I will advise where/how you can order them. The FLNRO Forest Health people will have some updated maps for us by Christmas (fires slowed them down this year, as with everything). 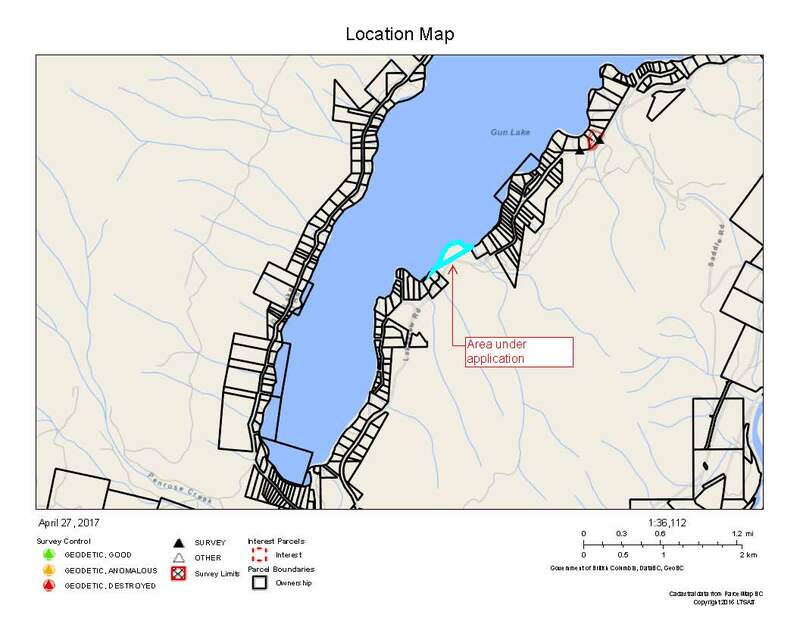 This summer I had an unprecedented number of complaints from Gun Lake property owners regarding noise from boats in the middle of the night, litter in the water, noise from other properties. Gun Lake property owners are generally pretty tolerant bunch...been there and had the parties too...however this year seemed to come with a different level of issues. I have put this survey together to judge the degree of the issue, where people thinks the issues (if there are issues) stem from and how they think they should be dealt with. Please answer honestly and your name is not needed.